International Noir Fiction: The Hypnotist, by "Lars Kepler"
The Hypnotist, by "Lars Kepler"
The new Swedish thriller The Hypnotist, by the psuedonymous Lars Kepler provoked a Swedish media swirl around the nom de plume and discovered that it hides the identity of a married couple, writers Alexandra and Alexander Ahndoril). The identity of the couple was long-revealed before the recent publication in English translation by Ann Long, and in any case the writers (who appaently have a reputation as literary authors in Sweden) are unknown in the rest of the world so there's no thrill of discovery. 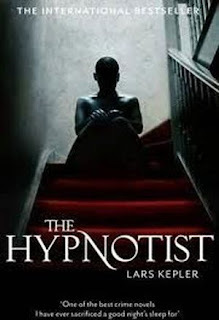 Reviews of The Hypnotist in translation have varied from positive, to positive-with-some-complaints, to negative. I find myself more to the right-hand side of that spectrum, I'm afraid. Joona Linna, he central investigator starts out to be an interesting character, but oddly in a novel of over 500 pages, he remains paper thin, merely a bundle of quirks (he's always right and not afraid to say so; he's Finnish; he has a tragedy in his past). More fully realized is the eponymous hypnotist and psychiatrist, Erik Maria Bark, enlisted by Joona to help interrogate a boy after most of his family is brutally murdered and the boy is left for dead. The plot is interesting and "cinematic," as several reviewers have commented (and a film is apparently on the way): short chapters broken at the point of some crucial revelation; lots of brutality; vivid scene-setting. There are numerous red herrings, and even the main thread of the plot gets left behind a couple of times (once for a very--very--long trip to the hypnotist's past therapy sessions (though the sessions produce both clues and more red herrings, as well as an explanation for Erik's abandonment of hypnotism until the present case, I found these passages distracting rather than revelatory). There are very clever twists, especially in the unveiling of the killer's identity and the shift to a new plot thread (when the hypnotist's son is kidnapped). I found the conclusion to be operatic--i.e. extravagant and not that believable, though linked to both the main plot and the hynotist's flashbacks. There's also an odd dichotomy between vivid and violent murder and a curious unwillingness to fully embrace the tragedies that the plot veers toward. I can't explain what I mean without giving too much away. I enjoyed the book more than my review my indicate, but found it too long and found Joona in particular to be too undeveloped (maybe he'll get his due in a sequel). I keep separate mental lists of new crime novels that I recommend to friends and others that I don't. 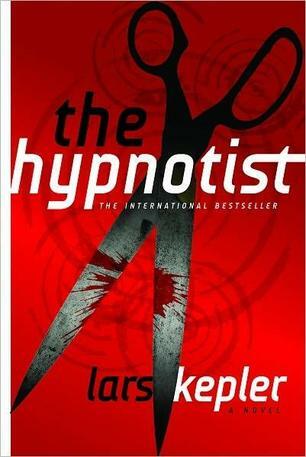 On balance, The Hypnotist falls into the latter category--but I'd love to hear from other readers and bloggers that have a more positive reaction to the book (would you recommend it to a friend, or to a friend who's a big fan of the Scandinavian crime wave? Would you recommend it as the first Swedish crime novel they should read? There are very different covers for the U.S and U.K.: I like them both, graphically, though the U.S. one focuses on a narrow plot point that's hinted at earlier on but only fully present very late in the story. No I wouldn't recommend this derivative, commercial novel to anyone, especially not as an example of Swedish crime fic. Plenty of other much better writers (A Larsson, Theorin etc). This book has some good elements but the authors have their eyes on the bucks and the Hollywood movie (of the jumping out of a woodshed with an axe variety). Pretty much my view, too http://publicsphere.typepad.com/toberead/2011/08/the-hypnotost-by-lars-kepler.html. I liked Hypnotist more than Maxine did but could think of a lot of better books to recommend to friends. I have also reviewed the book but the review is in a queue at Euro Crime, not published yet. My review is a bit more diplomatic than my comments here! The book does have potential I think but kind of wastes it. This won't stop it doing well, of course. Like Maxine, I found myself being more diplomatic in my review than maybe I should have been. I also have an interview with 'Lars Kepler', which turned out unlike any of my many other author interviews. Not sure what more to say. Well, the second book is better, especially plot wise, but still lacks real feeling. This book starts as a thriller becomes a mystery and through twists and turns reverts back to being a thriller. It kept me interested even though some of it seemed farfetched and contrived. Definitely not as good as "The Girl with the Dragon Tatoo" and the other two. This author is not as talented, but writes well. I actually read Mediations review before I read the book (unusual for me to read a review before the book) and was hoping I'd find it more interesting than he did.